(CBS/AP) PETOSKEY, Mich. - It looks like Michigan will have to find another "superhero" for now. Mark Williams, a man who was arrested after being spotted atop a building while wearing a Batman costume, was sentenced Monday to six months of probation, according to a report. 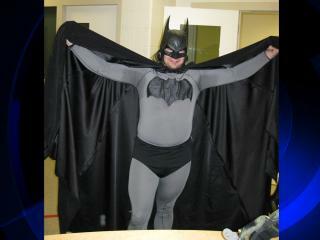 In addition, a judge told the 32-year-old Williams he's not allowed to wear costumes - including the Batman one he was wearing when Petoskey police picked him up in May, the Petoskey News-Review reports. The Harbor Springs man earlier pleaded guilty to attempted resisting/obstructing an officer. Williams said he was inspired by others who dress as super heroes to prevent crime and reach out to the homeless. Officers in Petoskey, about 225 miles northwest of Detroit, also confiscated a baton-like weapon and a can of chemical irritant spray. Williams says he didn't intend to use them.